Thank you to everyone who came out to my MFA thesis show in January 2015 in Boulder, CO. The content of this show involved a passionate research undertaking I am actively exploring currently, and likely will be for some time! Below is a documentation of the January, 2015 iteration of this research. Tune, an MFA thesis dance concert, explores the ways we tune into ourselves and one another through rhythmic movement and familiar beats. Play that tune, tune in, tune out, become attune to . . . 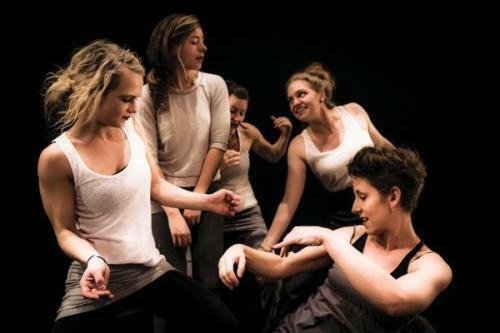 The concept of “tune” provides both musical and social inspiration for this production, which explores the ways that dancing to familiar music asks people to connect to themselves, one another and their world at large. Play that tune, tune in, tune out, become attune to; these meanings of “tune” are all investigated during the course of the show through relationship to a jacket, improvisation and set choreography. Given the personal nature of identity exploration, much of the show material was developed in collaboration with the project’s dancers and musicians. Tune moves throughout the entirety of the Absinthe House space, sparking both the performers and audience to become more attune to their surroundings, each other and the experience. After creating work in traditional theater settings for many years, choreographer Erinn Liebhard brings concert dance inspired by social practices back into its rightful home place; the bar. Tune is a unique performance experience that encourages people to both watch and do, fusing the enjoyment of having a drink, dancing to live music and the good company of friends and family with the experience of viewing live dance. A warm thank you to those who donated to this production: Jason and Jesse Anschutz, Desiree Bonhorst, Doug and Sheri Brunner, Lisa Conlin, Michele Dunleavy, Eileen and Stan Effertz, Jennifer Glaws, Karla Grotting, Adam and Kristen Hayes, Lindsay and Nic Hodnefield, Marian Hyun, Larry and Lynette Johnson and Family, Jenny and Matt Jungwirth, Joy and Wayne Liebhard, Reilly Liebhard, David and Kathy Olson, Kristoffer Olson, Kelsey Onkka, Carol Ottoson, Phil and Sarah Rickert, Zoe Sealy and all those who wish to remain anonymous.